The Leen Mills Primary School project concept was designed around 13 different animals which represented each class within the school. This meant that the pupils were able to identify with each of the characters as their own or one that they would later relate to when moving through the classes. 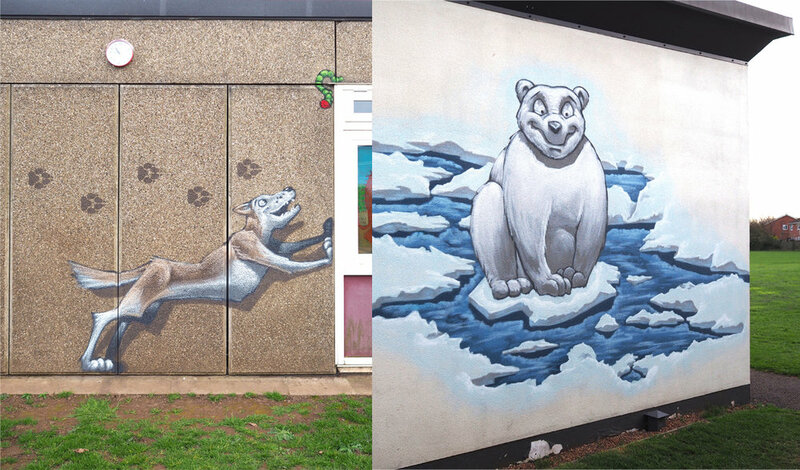 Artwork was initially proposed for a single wall however upon visiting the site it was agreed that a more effective use of the space and budget would be to spread out the details around different walls, creating an animal trail all around the school. It was a fun project and one which really saw a massive positive atmosphere envelope the school, from the pupils, teachers, parents and many others who passed by. It created an excited buzz and was a great way to bring new life into their old walls.